Gregory Fong was born in the city of Guangzhou in mainland China, and raised in Hong Kong. He spent five years during the mid-1960s learning Wu style Taijiquan. Before moving to the United States in 1969 he also learned the Northern Shaolin style of Yim Sheung Mo and Seven-Star Northern Praying Mantis Gongfu from Chan Yin Yee-a senior disciple of Luo Guang Yu and senior classmate of Wong Hon Fun. In 1986 he was one of a very few outsiders who, up to that time, had been allowed to live and study in Chen Village in Mainland China, the birthplace of Taijiquan. He also studied Baguaquan, Liuhebafa, Qigong, Xingyiquan, Yang style Taijiquan, and Yiquan. In 1989, Fong won first place in international Taiji/Gongfu tournaments in both San Francisco and Vancouver, BC. In that same year he won the all-around championship title in the Virginia U.S. All-T’ai Chi Tournament and was West Coast Champion of the Year in the Seattle Karate Tournament in Seattle, WA. In the late 1980s Fong traveled several times to Beijing to learn Yiquan from Yu Yongnian, a top student of Wang Xiangzhai, who had created the art in 1920s China. He also studied with Wang Xiangzhai’s daughter and subsequently traveled to other cities in China in search of further instruction. 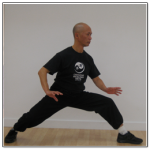 While Fong offers a class devoted solely to Yiquan training, he incorporates Yiquan fundamentals into all his classes. Fong has been teaching since 1970 in Portland, OR, but continues to travel to China each year in search of teachers to broaden his understanding of the Chinese healing and martial arts. He recently returned from a month-long stay in China where, deep in the mountains of Shaanxi Province, he met and learned from the Daoist master and Abbot of Wu Shan Temple, Xiao Zhixin. Here he practiced Bagua, Qigong for health and martial arts, herbal medicine for opening up the qi, and did research into the Yi Jing (Book of Changes). Many people these days look to the ancient “internal” martial arts of China-most often to Taijiquan-for gentle, yet effective, forms of mental and physical exercise. Unlike more familiar forms of exercise such as weight training, jogging, and so on, these practices claim to train both mind and body. The health benefits from such training for people of all ages and physical conditions are now widely recognized in the West. The contemporary practice known as Yiquan (pronounced ee-chwan) represents a radical distillation of these internal arts. By focusing exclusively and directly on the mind/body connection, Yiquan strengthens the mind by developing the body and strengthens the body by developing the mind. Unlike Taijiquan, Yiquan does not rely on external forms and so, proper instruction by a genuinely experienced teacher is essential. Greg Fong is one of the few truly knowledgeable teachers of Yiquan in the U.S.
Yiquan is a system for building and maintaining energy, strength, and health. Practiced effectively, Yiquan provides physical training that stimulates many vital body systems including the circulatory, endocrine, digestive, and respiration systems. Students will discover such health benefits as increased energy, better mental focus, more balanced posture, and improved structural alignment within a few weeks of training. Fong’s lifetime mastery of Chinese martial and healing arts provides his students an unequaled opportunity to achieve their personal goals for health and well being-based on the fundamentals of how the body and mind work together, and focused on improving each individual’s physical and mental fitness according to their age and level of conditioning. Operating the oldest continuous Chinese martial arts school in Portland, Gregory Fong currently offers classes in historic old-town Chinatown at the Chinese Consolidated Benevolent Association.